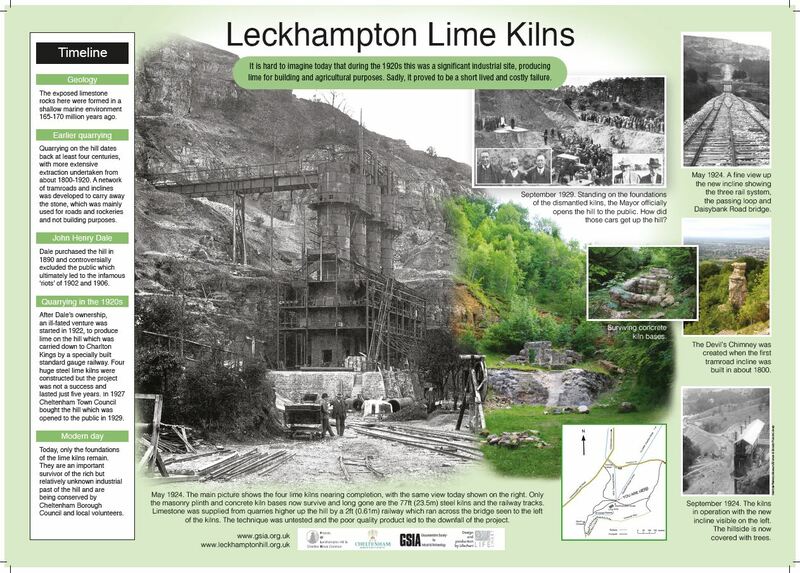 It may not be obvious today when walking around Leckhampton Hill but it once was a hive of industrial activity with quarrying of limestone being a major local activity. 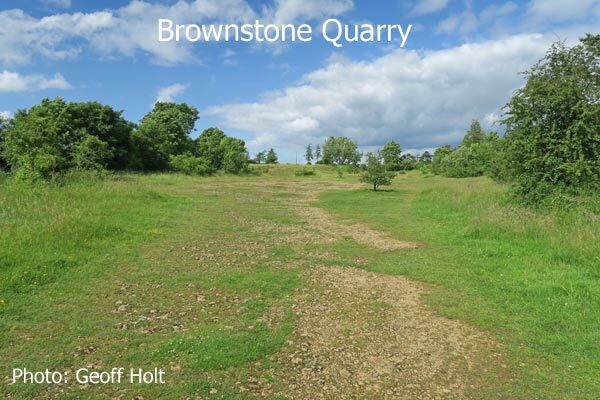 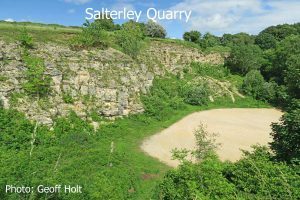 The site has been quarried for hundreds, and possibly thousands, of years but the most recent quarrying, for which there are records and visible traces if you know where to look, took place for a period of about 150 years from the late 18th century to the mid 1920s. 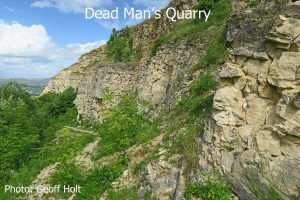 The output of the quarries around 1875 was about 8,000 tons per year and around 1915 there were about 50 men employed on the Hill. 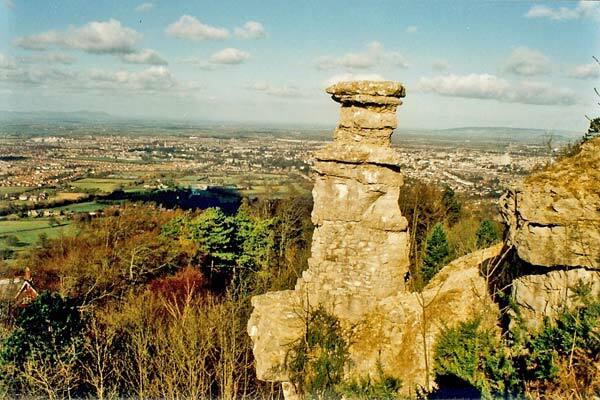 Leckhampton Hill was a source of Cotswold stone of varying quality. The best stone was suitable for carving for interior use and some of this can, for example, be found in the Cheltenham College Chapel. 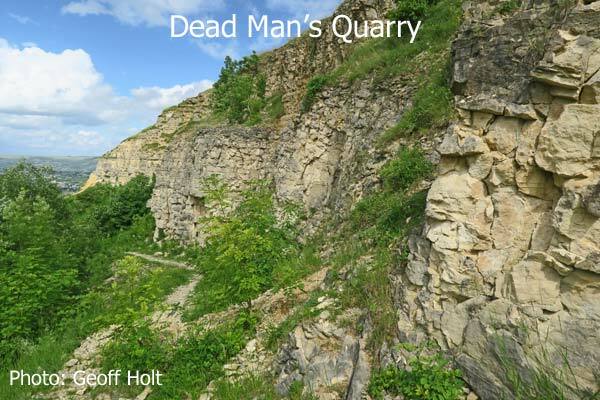 However, the bulk of it was of lower quality and used for the likes of road stone and gravel and as a source material for the production of lime. There have been a number of quarries around the Hill (see the map below) and most of the exposed rock faces seen on the Hill today are as a result of quarrying. 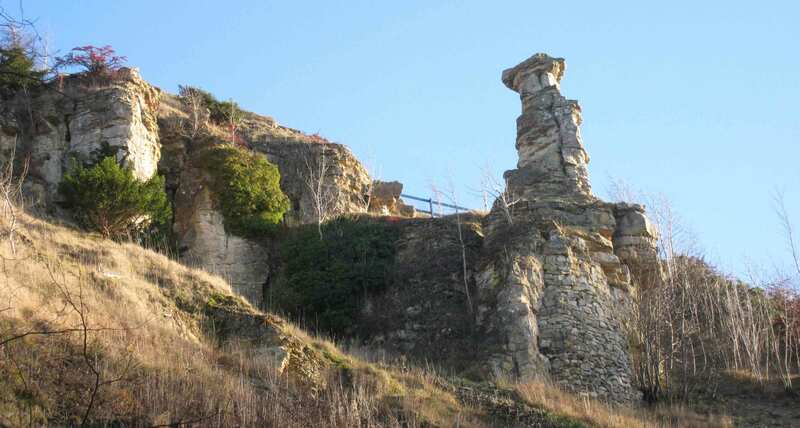 This includes the famous Devil’s Chimney. There are a number of stories and legends as to how the Devil’s chimney was formed but a likely explanation is that the construction of an incline up to the top of the Hill, to allow the stone to be removed down the hill by trucks, left an isolated section of rock that was then weathered over time, and possibly shaped by mischievous quarrymen, to result in the structure we now have. 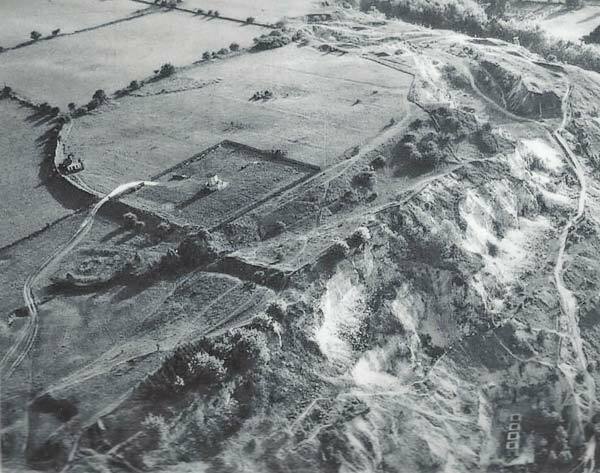 Most of the quarries were located around the edge of the escarpment – see the map below – but one (Brownstone) covered a large area on top of the Hill. Some of these quarries as they appear today are shown in the following photos. 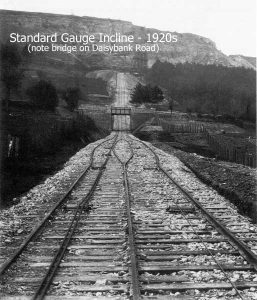 In order to remove the quarried stone from the Hill, a number of tramroads, railways and inclines were built. 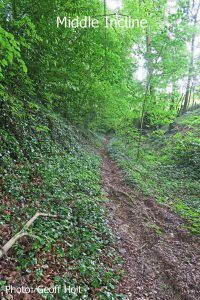 Although all of the metal rails, plates, machinery and winding drums associated with these were removed by the 1920s, quite a few of their routes still exist: they are the tracks used regularly today by walkers on the Hill, even though they may not realise it. 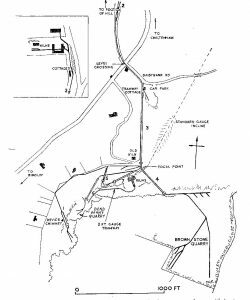 The map below (taken from the book ‘Old Leckhampton’ by David Bick) shows the various tramroads and railway inclines on the Hill c1925. 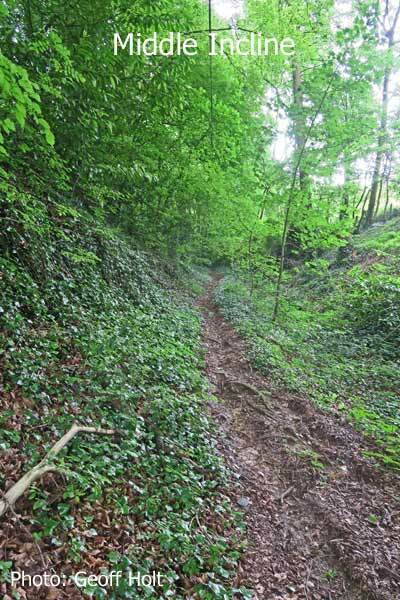 The Middle Incline, which starts by Tramway Cottage, is shown in the colour photo below as it is today. 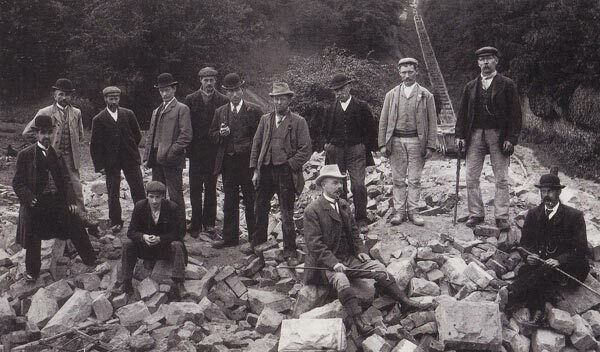 It can also be seen, in its working condition, in the background of the black & white photo taken in 1902 when Tramway Cottage was demolished by locals. 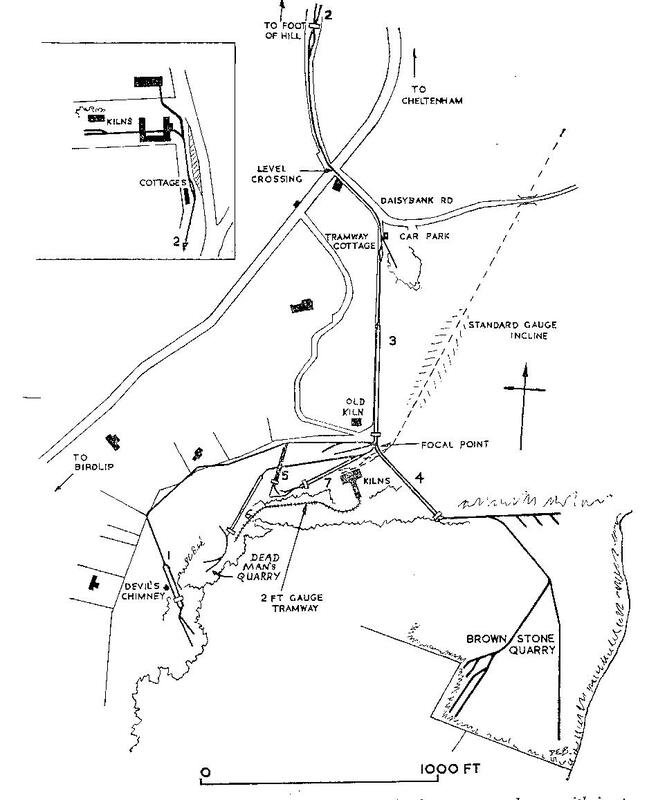 The above map also shows a standard gauge incline that was associated with a major redevelopment on the Hill in the 1920s. 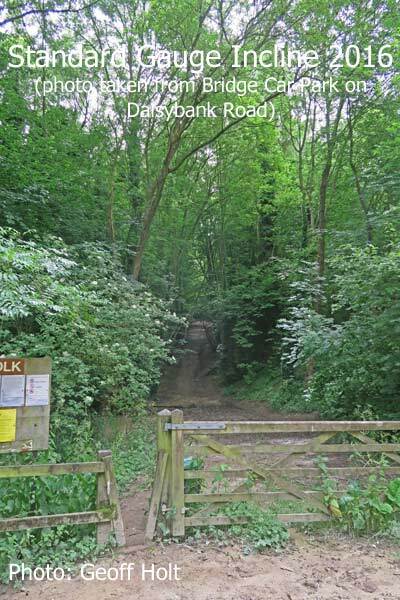 It is now the main track up the Hill used by walkers starting in the Daisybank Road car parks. 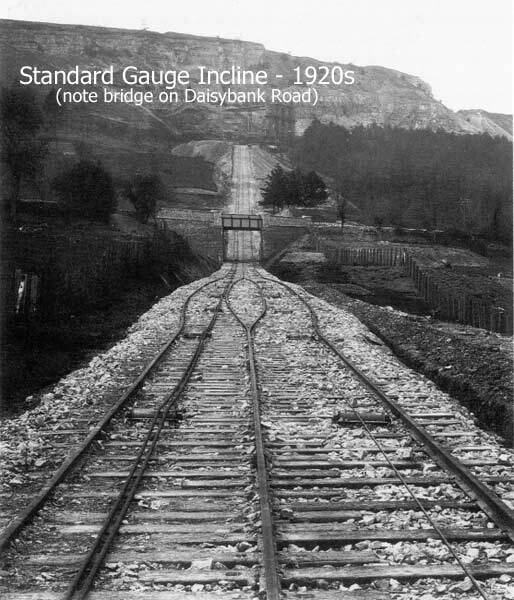 The very bottom of this incline, at a level lower than Daisybank Road, used to connect with further standard gauge tracks (on which was run a small steam engine) which ran eastwards and connected to a mainline (no longer existing) at Charlton Kings. In the early 1920s, supported by a Government loan as part of a scheme for easing unemployment after World War I, four large limekilns of 300 tons total capacity per day were constructed part way up the Hill at the focal point of the railways (see above map). However, this development was not a success and by 1927 it had closed and the plant sold and removed. 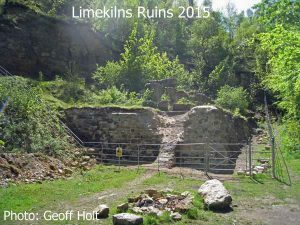 All that remains now is some stonework associated with the base of the limekilns and the ruins of an electrical plant house. In order to inform visitors to the Hill about the industrial past, the following interpretation plan has been installed close to the limekiln ruins. 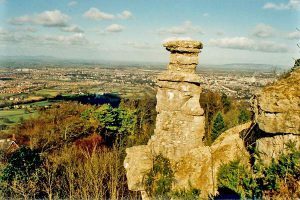 As part of the celebrations of the 100th anniversary of the ‘Leckhampton Riots’ and Industrial History Walk was held on the Hill in 2006. A photograph of the event is shown below. 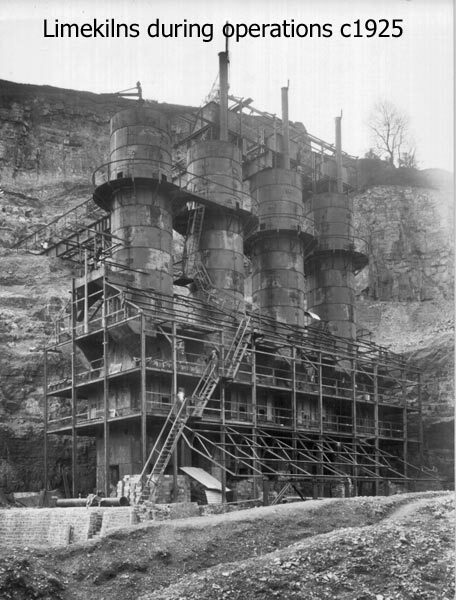 Should you wish to try to repeat that walk and learn a bit more about the industrial history of the Hill then read this document, Industrial History Walk April 2006, which was used for the 2006 event. 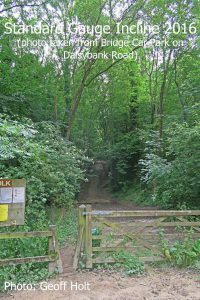 Other short articles can be found on: page 5 of FOLK Newsletter Issue 15 Spring 2004; pages 4-5 of FOLK Newsletter Issue 14 Winter 2003; page 5 of FOLK Newsletter Issue 13 Autumn 2003; pages 3-4 of FOLK Newsletter Issue 08 June 2002; page 4 of FOLK Newsletter Issue 04 June 2001; page 4 of FOLK Newsletter Issue 03 March 2001; page 4 of FOLK Newsletter Issue 01 September 2000.